William Shakespeare, the most celebrated poet in the English language, left behind nearly a million words of text, but his biography has long been a thicket of wild supposition arranged around scant facts. With a steady hand and his trademark wit, Bill Bryson sorts through this colorful muddle to reveal the man himself. 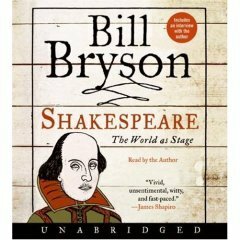 His Shakespeare is like no one else'sthe beneficiary of Bryson's genial nature, his engaging skepticism, and a gift for storytelling unrivaled in our time.